Shake off the sheep’s cloak, go on…be a lion! But as humans we do just the opposite. We crave for being understood by others and lament the lack of faith others have in us. What use is anyone else’s understanding if you don’t know, don’t realize, don’t accept that you are special. That you are capable. That you have been created to enjoy this lifetime and not suffer it? It is from awareness of your true Self that you will be introduced to the God within. Most of us just refuse to consider the argument that the energy that powers us, that keeps us alive, is the God we so desperately seek. Hence the lack of self-belief. 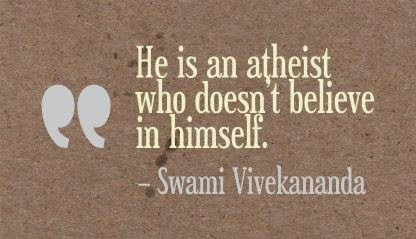 Swami Vivekananda, the 19thCentury Indian thinker says, ““He is an atheist who does not believe in himself.” This really is the most profound, yet simplest, definition of who we are. And if we understand this reality, we will be able to truly leverage the opportunity in front of us__which is on offer in the form of this lifetime, each day, each hour, and in each moment! So, that’s what you are – a lion, but because you are cloaked in sheep’s clothing, we have started imagining that we are incapable of being successful, being happy, being free, being bliss! To discover your true Self, shake that cloak off. Realize yourself. Arise…Awake…Go on, be a lion….! Author AVIS ViswanathanPosted on March 23, 2015 March 14, 2016 Categories Art of Living, Atheist, http://schemas.google.com/blogger/2008/kind#post, Inner Peace, Intelligent Living, One Seed Makes The Whole Earth Green, Osho, Realize YourselfLeave a comment on Shake off the sheep’s cloak, go on…be a lion!